At this rate, Valtteri Bottas could do for porridge what Popeye did for spinach. After one modest portion of breakfast oats, the Finn drove here in Melbourne's Albert Park like a man possessed, eclipsing team-mate Lewis Hamilton by almost 21 seconds in what he described as "my best race ever". Where on earth did this come from? Bottas has been caricatured as Hamilton's patsy, a dutiful Mercedes spear-carrier without championship credentials of his own. It was an image he seemed determined to shed yesterday, taking victory in the Australian Grand Prix by daylight, surging clear of Hamilton at a blistering rate and throwing in an extra point for the fastest lap. So unanswerable was his dominance that Mark Webber asked Bottas on the podium whether there was any culinary secret to it. "I had porridge," the winner smiled, blankly. All the brickbats for his anonymous 2018 campaign, in which he was trounced 11-0 by Hamilton in race wins, had wounded him. With a keen sense of timing under the fierce Australian sun, he delivered a masterclass to suggest that 2019 could be much different. Bottas' capacity for lightning starts has never been in doubt. In Austria, the setting in 2017 for one of his four grand prix triumphs, he got such a rapid getaway that some questioned if his car had been moving while the lights were on. He repeated the trick here, closing the gap to Hamilton in the first few yards, and swept into the lead through the opening corner. But it was the ferocity with which he protected his advantage that crystallised his intent. Advised in the closing stages by his race engineer to protect his tyres rather than chase the fastest-lap prize, he shot back: "I'm going to try. I want 26 points." Hamilton did not look too perturbed by his margin of inferiority. Sometimes, he can react truculently to losing to a team-mate - ask Nico Rosberg - but he accepted it with grace. "I don't see it as a difficult weekend," he said. "It's a very light patch of adversity." Still, he will realise the danger of letting Bottas sneak ahead. 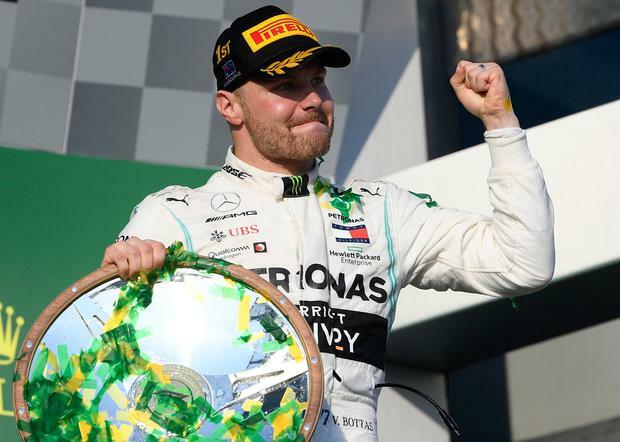 At the start of the 2016 season, he was flat and error-prone, allowing Rosberg to win the first four races and establish a cushion he never relinquished.